Sunwing and Karisma are giving agents free trips to great resorts, including El Dorado Casitas Royale in Mexico's Mayan Riviera. Sunwing is making this a month to remember for travel agents. For the month of February, Sunwing is encouraging agents to Learn, Earn and WIN with Karisma Hotels & Resorts. Until February 28th, agents can earn 2X STAR Agent Reward Points that convert into cash on all new bookings to Karisma properties, for departures until October 31, 2019. On top of their earnings, each time an agent makes a booking to a participating resort, they’ll be entered into a weekly contest for a chance to win an all-inclusive vacation for two to a Karisma resort included in this promotion*. The more bookings agents make, the more chances they have to win! This promotion includes a wide selection of top-rated resorts including family-friendly properties – Sensatori Azul Beach Resort Jamaica, Sensatori Resort Punta Cana, Azul Beach Resort Riviera Maya, Generations Riviera Maya, Nickelodeon Hotels and Resorts Punta Cana and Sensatori Azul Beach Resort Riviera Cancun which will be renamed to Azul Beach Resort Riviera Cancun on May 1, 2019. Adults only properties included in the promotion are El Dorado Casitas Royale, El Dorado Maroma, El Dorado Royale, El Dorado Seaside Suites, Hidden Beach Au Natural Resort and the world-class Palafitos Overwater Bungalows. Located on some of the most beautiful beaches in Mexico and the Caribbean, Karisma Hotels & Resorts offers five-star properties known for providing a Gourmet Inclusive® experience. Each resort offers an array of gourmet culinary options and boasts impeccable service with attentive beach butlers, 24-hour room service and more. With opulent resorts to suit all types of travellers, families can opt to stay at Nickelodeon Hotels and Resorts Punta Cana, featuring water slides and beloved Nickelodeon characters. 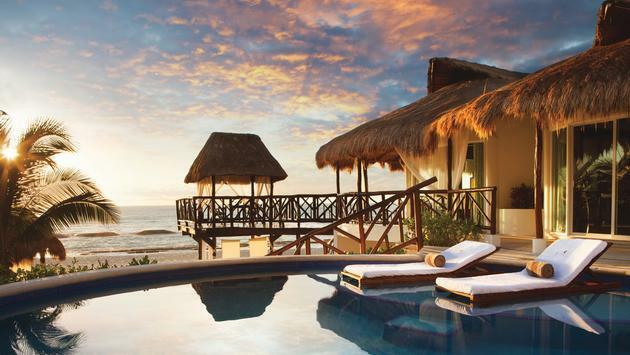 Couples may prefer El Dorado Royale, an adults-only oasis and winner of the prestigious Four Diamond Award. In addition to incentives for agents, travellers can also benefit from savings of up to 40% when they book a Karisma Hotels & Resorts vacation package with their travel agent throughout the month of February. Customers will also receive resort credits totalling $500 that are redeemable for wine, massages, a romantic dinner and a room upgrade when they choose to stay at select Karisma resorts**. Plus, several Karisma properties offer generous group rates where the eighth adult travels free for every seven adults booked**. This offer is also combinable with Karisma’s Double Canada Cash, Cash for Your Bash and Your Stay Your Way promotions. All Sunwing vacation packages include return flights on Sunwing Airlines where passengers can sit back and relax while on board with award-winning inflight service, complimentary non-alcoholic beverage service and buy on board selection of light meals and snacks with choices inspired by Food Network Canada Celebrity Chef, Lynn Crawford. Passengers also benefit from a generous complimentary 23kg checked luggage allowance. Full more details on the current promotion, visit www.sunwingagents.ca. Up-to-date information on vacation packages can be found at www.sunwing.ca . **Resorts eligible for resort credits and group discounts are El Dorado Royale, El Dorado Casitas, El Dorado Seaside Suites, El Dorado Maroma, Sensations Azul Beach Resort Riviera Cancun, Azul Beach Resort Riviera Maya, Generations Riviera Maya, Nickelodeon Hotels & Resorts Punta Canada and Hidden Beach Resort.